If I could go back in time and teach myself one thing, it would be this: your book vendors have great features in their standing order programs to make book ordering EASIER. Oh, the hours I could have saved, especially when I was away on maternity leave, but still trying to order books for my teen department. 1. They will automatically make lists for you. These can be reports or automatic orders. Do note: if it is an automatic order, you still will be given at least two weeks to check the order and see if you want to delete anything. So even if you have a limited budget, you have full control of how many books are being bought and when. You can also change automatic orders to reports at any time. 2. If you upgrade your account (which doesn't cost much), you can get FULL TEXT REVIEWS on hardcovers from all the top sources: Library Journal, Kirkus Reviews, School Library Journal, VOYA, Publisher's Weekly, Booklist, etc. In Ingram, they only provide this for hardcovers, but you can find these reviews listed below the book's description, all together and in one place. 3. These full text reviews are handy if you are researching older books for your collection, especially if you realize you need books on a certain subject but know that you can't just rely on new publications to fill this gap in your collection. 4. You can also create review alerts where they'll make lists of all books that have been reviewed that month. There is even an option to limit lists to only the starred reviewed books, if you don't have time to go through them all. 5. They make lists for you of books that are on award, book club, and state lists. You know, those places you're checking out anyway to see if you want to order them. And, since you are now receiving full text reviews, you can easily see what other people thought of these specific books, too. 6. Everything is customizable, which means you can select specific nonfiction sections, fiction, and graphic novels as well as the age of the audience, so you only get lists of books you care about. 7. Lastly, it is such a time saver to have all these books in your online cart, just waiting for you. 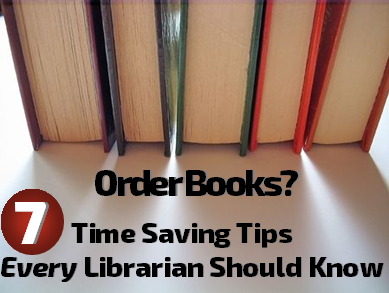 Those seconds add up when you're typing in ISBNs and titles; especially if you can't remember if you already order it, so you're typing it in again.